Barasbi Baytugan was born on July 15, 1899, in Vladikavkaz (North Ossetia), a town in the Caucasus Mountains. He studied law in St.Petersburg. But after the Bolshevik revolution took place, he voluntarily joined the “White Army” and fought against communists. In 1922 he immigrated to Prague where he completed his University education. Then he worked for the immigrant organizations in Eastern and Western Europe. In 1930 Baytugan began publishing the “The Highlanders of Caucasus” magazine, which later on changed the name for “North Caucasus” and became the common for all Caucasians in Europe. After WW2 Baytugan lived in London, working in cooperation with well-known scientist Sir G.B.Baily. 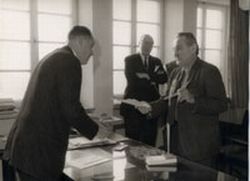 In 1953 Barasbi Baytugan returned to Germany. A year later he joined Radio Liberty's North Caucasian Service, first as a writer/editor, and then as a program specialist. In March 1966, Barasbi Baytugan was promoted to chief editor (succeeding Ossetian as well Elbrus Chadarzev), a post he held until 1970. He died in 1986 in Munich.